She accordingly murdered one child and attempted the life of the other. 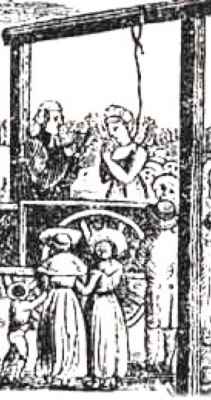 Executions being a much favoured entertainment of the time, Elizabeth Morton was hung from the gallows as an Easter spectacle. Her body was dissected by a surgeon at Calverton, and the public inspection that followed awakened all the curiosity of the surrounding villagers. Such were the huge assemblies at public executions, that on August the 8th 1844 thirteen people died and more than a hundred were seriously injured in the crush of 'countless thousands' amassing to witness the hanging in front of the County Hall of one William Saville, 29, a labourer of Arnold who murdered his wife and children with a razor in Colwick Wood. The last execution at Gallows Hill, which was situated near the present junction of Mansfield Road and Forest Road, was that of William Wells in 1827. The gallows were removed to Shire Hall in 1831. They had been in use from before 1558. The delivery of bodies of murderers, after execution, to the surgeons for dissection, was required by an Act of Parliament, passed in 1752. Note: Field names below Ramsdale Farm, 'Little' and 'Great Gibbet Dale' indicate a gallows existed close to Calverton where the Oxton Road met the Nottingham/Rufford Road - today's A614.